FCC has developed new algorithms and software tools for laser scanned point clouds enabling manufacturing industry to maximize equipment utilization, save time and enhance their competitiveness. The development has been in close cooperation with Volvo Cars, Wingquist Laboratory, the Production Area of Advance at Chalmers, and ATS AB. The researched technology will in the next step be utilized in the Building Futures Area of Advance with the goal of increased productivity and quality. The revolution is upon us but it is happening via something surprisingly small; infinitely small in fact. And in spite of their size they are now filling up terabytes of hard drives around the world. With these tiny wonders many concepts which have so far only lived in the minds of researchers and the pages of scientific journals are now entering the industrial world. The digital factory is upon us and the empowering technology is a laser-scanned point cloud. Over the last decade laser scanners have ushered in a revolution, thanks to hardware and software for laser scanners becoming orders of magnitude cheaper. This has opened up new business opportunities revolving around the scanning and documenting of physical factory facilities. However, the scanning and documentation of industrial complexes is only the first step. The most important part for industry is what comes next; deriving value from their data. This means asking questions about the scanned factory layouts such as, does this new chassis fit along the assembly line? Can we rebuild this manufacturing process? Is there enough space for the new production line? It is questions such as these that new and unique tools developed at FCC are able to answer, and it all began with a piece of cardboard. 3D Scanning and Point Clouds A 250 meters scanned factory section from Volvo Torslanda (courtesy of Volvo Cars). Before the advent of laser scanning, the testing of new car models at Volvo Cars was usually done with cardboard silhouettes of chassis. They were moved through an assembly line on a Sunday while nothing was being produced. In spite of this, there were sometimes problems with the verification of new car designs. During introduction, new models could crash in the manufacturing line with the result that the chassis became scrap metal, and worst of all, a stop in production since different models are assembled on the same line. It was around 2009 when Volvo Cars saw that laser scanning had matured to the point of now being affordable and reliable. So they turned to FCC to solve one of their major bottlenecks in production; the verification of new car designs. We were able to take their point cloud data and develop new tools which could combine both traditional CAD geometry and point cloud models in one simulation tool. This tool allowed Volvo to answer one of their important design questions by being able to guarantee that new designs would pass along their assembly line collision free. This has saved Volvo Cars both money and time in their verification processes. Distance Measure Calculating the exact shortest distance between the chassis and the surrounding point clouds for the 250 meters. The distance measure is indicated by the red line (courtesy of Volvo Cars). Since our first successful foray into the point world, we have continued our development of point cloud tools. We are now able to carry out most of our usual virtual processes and computations in point clouds. Companies can now compute distances and collisions, path plan, compute largest non-colliding volumes and much more in hybrid triangle mesh-point cloud environments. We have also started exploring the concept of unlimited detail which allows users to visualise massive point clouds with billions of points and compute distances between such point clouds and other objects. Our tools leverage the latest technological advances to produce fast and accurate results. For example, when computing the largest non-colliding volume, we build a sparse hash-based octree to be able to abstract away the geometry and perform fast collision queries. Then by using the adaptive bisection method we are able to quickly determine which areas of the path do not constrain the largest non-colliding volume. Finally all computations are done in parallel to exploit the latest multi-core computer architectures. In the meantime, we have also successfully demonstrated the academic importance of our work by publishing 6 new papers in the area. We have saved our industrial partners significant sums of money with the new tools and allowed them to do things virtually which were previously impossible. We are also noticing significant interest from other companies for the tools we have developed. 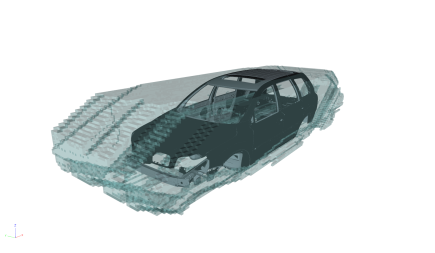 Body Window Visualizing the maximum collision-free volume, with the car chassis visible, that can pass through the factory with a specified safety margin (courtesy of Volvo Cars). These advances will lead to a new revolution in the usage and value of virtual processes. Having a digital factory model, which can genuinely add value by allowing engineers to answer important questions with it not only saves money but can reduce lead times, make cooperative work easier and simplify work flows. Although the objects we are dealing with are infinitely small their benefits seem infinitely large.